April 2018: Is a Trade War a Real Threat? What an interesting time to be alive. Although watching the global stage is fascinating, some “boring” for a while would be nice. It is like a soap opera out there! But I wish it was like a soap opera, not real life and didn’t affect us. We’re all in this together. So let’s take a look at what’s rattling the markets. This week was the biggest slide for U.S. stock indices since January 2016. Thanks to the Facebook scandal and President Trump’s new round of tariffs on China, we are seeing a retest of the lows set in February. The president announced on March 22nd that his administration had found ample evidence for intellectual property theft by China and therefore would impose $60 billion of tariffs on Chinese imports. He added that this would be the first of many. Mere hours later, China retaliated with a list of their tariffs on US imports which amounted to $3 billion. Trump did not list any specific products that the $60 billion in tariffs would apply to (although he’ll come up with those later). It’s an almost off-the-cuff number to get closer to his goal of reducing our trade deficit with China by $100 billion. That deficit currently stands at about $370 billion. Decreasing the deficit is not a bad idea, but economists think there are better ways than to impose tariffs. Tariffs have a way of boomeranging on the thrower – in the long run; they increase inflation and decrease GDP. Not a good combination. Some think Trump is trying to create a stage for negotiation, using big rhetoric to see how his opponent will respond to strike a deal ultimately. Answer they did, swiftly and specifically. China had a list prepared in anticipation of the president’s move. I wager they have thought ahead of every possible contingency, starting with a relatively low number was their way of sending a warning shot across the bow. China is willing to come to the table and talk. They do not want a trade war but they have made it clear that if push comes to shove, they will deliver one. The ball is now back in the president’s court and what he does next will be critical. If he adds more tariffs or targets imports of significance, China could deal the U.S. a punch by adding tariffs on three key areas: aircraft, soybeans, and semiconductors. All three of those U.S. industries depend on China heavily, and tariffs would be a substantial blow. It would be altogether worse if China decided to buy those goods elsewhere. Moreover, it is that worry that has sent those critical sectors of the market spiraling this past week. Might this turn into a trade war? Perhaps, but I think it’s premature to put significant odds on it. We haven’t had a full-on trade war since the Great Depression. We have had skirmishes here and there. Every president has placed tariffs on something to insulate a subsection of U.S. workers. It was steel for President G.W. Bush and for President Obama, it was tires. But what we are experiencing today has already escalated beyond those minor historical scuffles. Let’s say this does turn into a trade war. Are there any solutions? Yes. U.S. companies hurt by the tariffs here could go to the federal court for help to try to overturn them. Affected countries have already said they will appeal to the World Trade Organization for help. However, that would take time, a couple of years most likely and a lot of damage can be done in that span of time. Specifically, global economic growth might grind to a halt just when the entire developed world was experiencing accelerating growth. Inflation could rise because of increased costs and that would be enough to push the global economy into a recession. There are enormous implications and ramifications of an all-out trade war. This is why there hasn’t been one in almost 100 years. No one wins. Wow, that sounds dire. Is now a good time to move out of stocks? When I look at objective data and take personal biases out of the equation as much as anyone can, my opinion is no. The fundamentals of the economy are still intact. It’s too early to say what the worst case scenario is what’s going to play out. 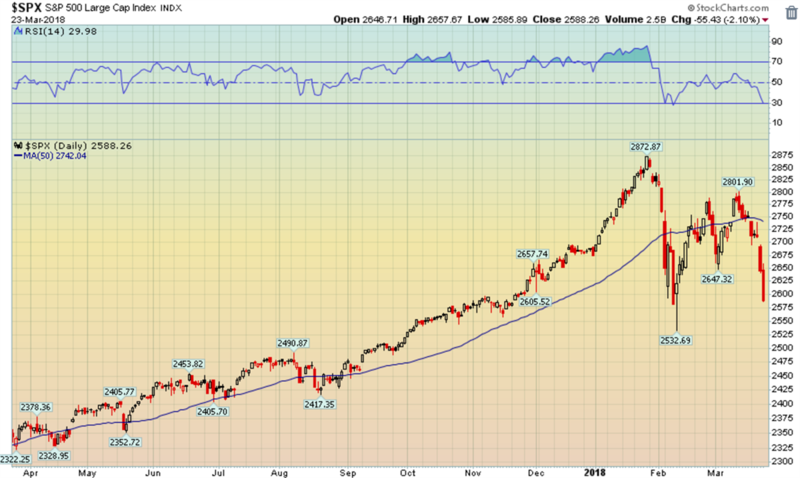 If this resolves, the market may rocket past prior highs and leave anyone sitting in cash in the dust. At this point, it would be both an effort to try to time the market and an emotional decision - not a decision made on rationality. 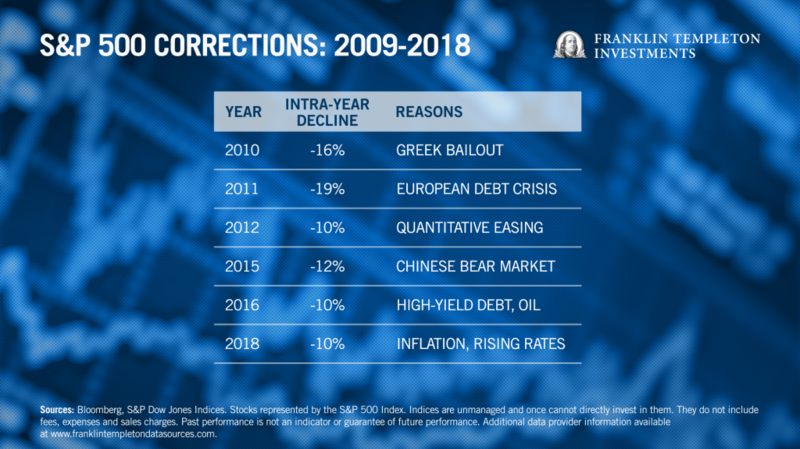 This is far from the first “freak out” moment investors have had to deal with in the past nine years. There’s always a possible worst-case scenario and this time is not any different. Looking at the chart below I am reminded of the European debt crisis in 2011. Remember when the market fell 19%, and people were afraid the EU was going to break apart? How about the Chinese bear market of 2015 when the market lost 12%, and people were fearful China was heading into recession and dragging the rest of the world down with it? That is just to name a couple. Stay the course. Don’t panic. As always, if you want more specific advice, we’re happy to help. Give us a call or send us an email. The first meeting is on us. Investors cannot invest directly in indexes. The performance of any index is not indicative of the performance of any investment and does not take into accounts the effects of inflation and the fees and expenses associated with investing.